We’d love your help. Let us know what’s wrong with this preview of The Giant Smugglers by Matt Solomon. When thirteen year old Charlie Lawson discovers a giant (yes, a real GIANT) hiding in an abandoned warehouse, he's finds himself smack in the middle of a doctor's evil plot to capture these harmless, gentle creatures and harvest their growth hormones. On the other side of this fight, a small secret group of humans try to help the giants-Bruce, in particular--from being expo When thirteen year old Charlie Lawson discovers a giant (yes, a real GIANT) hiding in an abandoned warehouse, he's finds himself smack in the middle of a doctor's evil plot to capture these harmless, gentle creatures and harvest their growth hormones. To ask other readers questions about The Giant Smugglers, please sign up. Amazing book, great story. Full review to follow closer to publication. I was privileged to read a review copy of this book months before it was released. From the first glimpse of the cover, through reading the description of the book I was very keen on reading it. It did not disappoint. This was the first book I have read by either Pauls or Solomon and I really hope there will be more. I must warn you this is a highly addictive read. If you find at times you have a hard time putting down boo Amazing book, great story. Full review to follow closer to publication. Read the review on my blog Book Reviews and More. Charlie's biggest thrill lately has been being the reigning champ of Total Turbo, an online driving game. His biggest annoyance is D.J., his mom's new boyfriend, who tries too hard to be his friend. And his biggest adversary has been the school bully, Fitz. When Charlie decides to explore a seemingly abandoned warehouse across the street from his apartment, he is in for the biggest surprise of his teenage existence so far. Bigger than when his brother ran off to join the circus! Charlie comes fa Charlie's biggest thrill lately has been being the reigning champ of Total Turbo, an online driving game. His biggest annoyance is D.J., his mom's new boyfriend, who tries too hard to be his friend. And his biggest adversary has been the school bully, Fitz. When Charlie decides to explore a seemingly abandoned warehouse across the street from his apartment, he is in for the biggest surprise of his teenage existence so far. Bigger than when his brother ran off to join the circus! Charlie comes face to face with a GIANT! He can't believe his luck! This giant is surely a cure for his boredom and his ticket to big time fun! Charlie isn't the only one hoping to capitalize on the giant. He soon finds out a secret branch of a corporation is searching for the giant to use him for growth hormone experiments. But giant smugglers, one step ahead of them so far, will do anything to prevent this and get the giant safely to his homeland…and earn a little giant’s gold in the process. Disclaimer: I have known one of the authors(Matt Solomon) for more than 20 years. There's a chance I'm biased, but only a very small chance. The Giant Smugglers reminds me a lot of the books I read when I was younger, with a lot of action and just a touch of the supernatural. I would describe it as a cross between Charlie and The Chocolate Factory and the X-Files. A young boy is stoked when he discovers a 25 foot giant in a warehouse across from his apartment in Richland Center, Wisconsin. He has Disclaimer: I have known one of the authors(Matt Solomon) for more than 20 years. There's a chance I'm biased, but only a very small chance. I would describe it as a cross between Charlie and The Chocolate Factory and the X-Files. A young boy is stoked when he discovers a 25 foot giant in a warehouse across from his apartment in Richland Center, Wisconsin. He has no idea that soon he will be fighting lots of bad guys to protect his friend! I misunderstood this one, thinking it was giants doing smuggling (like really big pirates); but instead it's about a boy who finds a giant that is being hunted for his extraordinary DNA by evil scientists...and he has to smuggle the giant to safety and also the kids have to defeat the evil scientists. This is a cute adventure that will definitely appeal to younger tweens and teens....a fun, fast read. This novel has a lot of action and a decent premise, but is weak on characterization of ANY characters. It feels like the characters were just put in place to do a certain job in the story, and who cares what it really means to them, to us, to larger world. Did not finish. The characterization in this novel was unfortunately weak. I found it a bit like a novelization of an action movie. The characters are put in place to serve a particular purpose in the story and thus were not developed in a way that I found meaningful. 4.5 stars I found this novel’s cover intriguing so I had to read it. Inside, I found a story about a simple giant who was trying to make his way home via a network of smugglers and Charlie, a young boy who befriends the giant and together they have quite a journey. Charlie loved on-line video games, he was a champ, life was good until he met Jamie and then Charlie decided it was best if he tried to keep out of Jamie’s line of vision. Jamie was out to get Charlie. Charlie immediately felt a conne 4.5 stars I found this novel’s cover intriguing so I had to read it. Inside, I found a story about a simple giant who was trying to make his way home via a network of smugglers and Charlie, a young boy who befriends the giant and together they have quite a journey. Charlie loved on-line video games, he was a champ, life was good until he met Jamie and then Charlie decided it was best if he tried to keep out of Jamie’s line of vision. Jamie was out to get Charlie. Charlie immediately felt a connection to the giant when he discovered him and he decided that he didn’t want to share him with anyone. This bond grows and deepens throughout the novel and I enjoyed how they depended on one another. They are like brothers and the inexperience of the giant to the size and ability of the giant’s greatness has these two depending on each other in different circumstances throughout the novel. Charlie becomes the giant’s teacher, teaching him simple every day things and also important lessons about life. Charlie calls him Bruce after a movie Charlie shares with him and looking at the cover, I think the name fits him. Bruce teaches him many things, mature things and they both learn about family as their friendship grows. People are looking for Bruce, he’s a giant and to have one at their disposal would be spectacular. They’ve been hunting them down but haven’t gotten close to one yet. They’re trying to perfect their growth serum; a giant would make their life easier. Jamie discovers Bruce and he is angry at his father for Jamie’s father is one of the individual’s who are chasing after Bruce and Jamie believes that Bruce is a product of his father’s research. At the lab, Jamie confronts his father. A researcher brings in another test sample of the growth serum they are working on, a sample for the lab rats, but Jamie reaches for the serum and stabs himself with it. No! It’s too late, Jamie begins to grow, his anger along with him. It becomes a journey, a race, an adventure as the giants each run for their destination and Charlie tries to protect his best friend. I loved the ending, it was magical and adventurous. This was a great fantasy, adventure book with a boy leading the way. THE GIANT SMUGGLERS was a fast-paced and exciting adventure story. Charlie, who loves playing video games, is surprised to meet a giant hidden in the abandoned warehouse next to his apartment building. The two become fast friends. After watching some old Bruce Lee movies and watching the giant duplicate Lee's moves, he names the formerly nameless giant Bruce. Charlie and Bruce both have enemies. Charlie is on the run from the new kid in school who has a fierce temper. Fitz has just come to the ar THE GIANT SMUGGLERS was a fast-paced and exciting adventure story. Charlie, who loves playing video games, is surprised to meet a giant hidden in the abandoned warehouse next to his apartment building. The two become fast friends. After watching some old Bruce Lee movies and watching the giant duplicate Lee's moves, he names the formerly nameless giant Bruce. Charlie and Bruce both have enemies. Charlie is on the run from the new kid in school who has a fierce temper. Fitz has just come to the area with his scientist father who is researching human growth hormone and who is chasing rumors of giants. He is also injecting his son with a serum he has created which is making Fitz stronger but also prone to rages. Bruce is on the run from those who want to exploit him. Fitz's father is being pressured by the corporation funding his research to produce a real dragon or lose funding. He has hired a mercenary named Stick who comes with a wide variety of superhero gear to capture the giant. Charlie and Bruce take off on a wild adventure to get Bruce to safety. 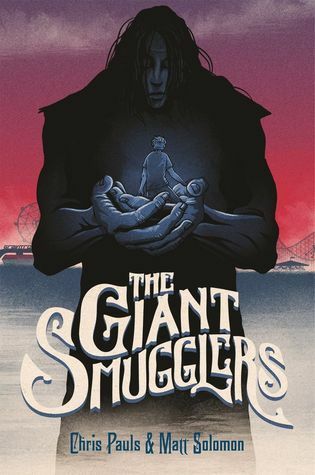 "The Giant Smugglers" by Chris Pauls and Matt Solomon is a character driven story that sets the story up well in at the start, and leads to a fast paced second half. Readers who enjoyed Dahl's BFG will find a readalike in this tale. Ultimately, the writing is held back by some confusing sentences in the middle and end. Otherwise, worth picking up! Fast paced fantasy adventure, with friendship as the central theme. Charlie, and his mom, live in a generic small town, and the highlight of his day is to log on to his favorite online video game. That changes when he discovers a young giant hiding in an abandoned warehouse across from his apartment building. This book will especially appeal to boys - I know of a few who will want to read it! This is a children's book geared toward middle grade readers, but I actually enjoyed it quite a bit. This book was a very fast paced adventure with no dull moments. I would highly recommend this book. Can't decide whether it's a 3.5 or 4, but it was cute and entertaining. I expected it to be a spin on the BFG, but it isn't. What kid doesn't like a fun adventure about giants? Great story. My review for this book will be published in School Library Journal. An exciting adventure for older children and teens! I thought the writing was uneven.....but the basic story was good. Co-author of The Giant Smugglers and Deck Z The Titanic Unsinkable. Undead. with Chris Pauls. Contributor to the Onion and other fine publications.